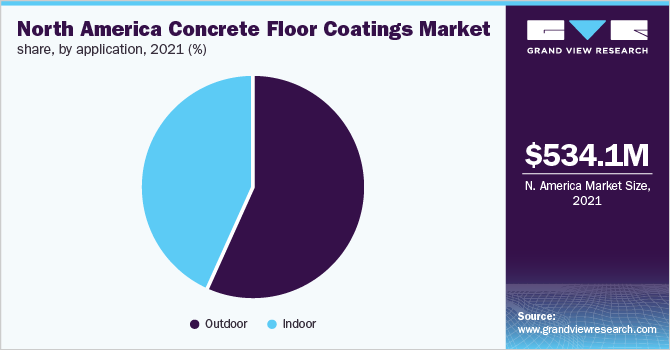 North America Concrete Floor Coatings Market Analysis By Product, Application To 2020 - Grand View Research, Inc.
North America concrete floor coatings market demand was 214.3 kilo tons in 2013 and is expected to reach 329.0 kilo tons by 2020, growing at a CAGR of 6.3% from 2014 to 2020. Concrete floor coatings are used for providing excellent resistance against wear & tear, and high temperature to indoor and outdoor areas in residential and commercial buildings. Recovery of the construction industry in the U.S. is expected to have a positive impact on concrete floor coatings market growth over the forecast period. Positive construction industry outlook in Mexico on account of increasing government expenditure on infrastructure improvement is expected to drive concrete floor coatings market. Under the “National Infrastructure Program 2014-2018” introduced by the government of Mexico, USD 297 billion has been allocated for the development of domestic energy sector and includes 124 projects for the establishment of power plants and natural gas pipelines. However, growing demand for resilient floorings and soft coverings in North America is likely to restrain concrete floor coatings market demand in the near future. Concrete floor coatings emit substantial amounts of VOCs over a period. Rising awareness regarding the harmful effects of VOCs on human health has resulted in the implementation of a stringent regulatory framework which is anticipated to restrict market growth. The U.S. EPA and Government of Canada passed the National VOC Emission Standards for Architectural Coatings and AIM regulations respectively, which are anticipated to impede concrete floor coatings market growth. However, regulatory inclination in Mexico to promote the growth of chemical and petroleum sectors at a domestic level is anticipated to open new opportunities for concrete floor coatings market over the forecast period. Epoxy based coatings were the largest product segment in 2013 and are expected to dominate the North America concrete floor coatings market over the next six years on account of low cost. Epoxy coatings exhibit superior properties such as excellent adhesion, chemical and heat resistance and good electrical insulating properties. The aforementioned properties and low cost of epoxy concrete floor coatings as compared to their counterparts are anticipated to have a favorable impact on market growth in the near future. However, these coatings are ineffective when exposed to UV, which is expected to have a negative impact on the market. Polyaspartic coatings are expected to be one of the most promising product segment on account of offering better UV protection, wear, and abrasion resistance. Other products types used in the market include acrylic and polyurea coatings. Development of biopolymers such as bio-polyurethane is expected to open new market opportunities for polyurethane coatings market over the next six years. Concrete floor coatings are primarily used in indoor applications, accounting for over 60.0% of the North America concrete floor coatings market in 2013. Gains in the U.S. construction and infrastructure industry are expected to increase demand for residential and commercial structures. Outdoor applications are anticipated to witness the fastest growth within the North America concrete floor coatings market over the forecast period. Rising penetration of sports stadiums in the U.S. on account of the high prevalence of sports games such as football, rugby, ice hockey and tennis in the U.S. and Canada is anticipated to promote the role of flooring solutions. Rising importance of flooring solutions is anticipated to fuel the demand for concrete floor coatings in outdoor applications in sports stadiums. U.S. was the largest country for North America concrete floor coatings market in 2013, and the trend is anticipated to continue over the next six years. The robust infrastructure of commercial and residential structures in the U.S. is anticipated to fuel concrete floor coatings market demand. High penetration of manufacturing facilities of automotive, FMCG, pharmaceutical, food & beverage and oil & gas sectors in the U.S. is expected to promote the demand for concrete floor coatings over the forecast period. However, Mexico is likely to witness the fastest growth over the projected period on account of rising disposable income, urban development, and population growth which are anticipated to promote demand for residential structures in Mexico. Favorable government policies for infrastructural development at domestic level through the National Infrastructural Plan (NIP), is expected to promote concrete floor coatings market growth over the forecast period. Low manufacturing cost coupled with growing demand for vehicles have promoted new investments in Mexico automotive industry. Canada is expected to witness growth as a result of rising production output of unconventional sources such as shale gas coupled with the introduction of the New Building Canada Plan in 2007, for ten years. North America concrete floor coatings market was dominated by four companies, viz., Stonhard, General Polymers, Sika, and BASF. Other key participants present in the North America concrete floor coatings market include Pratt & Lambert Paints, PPG, Tennant Company, Bayer, and DuPont. In April 2012, DSM and Empresa Brasileira de Biotechnologia (Ebrabiotech) signed an agreement to launch bio-based concrete floor coatings. In March 2012, Tennant Company launched Eco-ITS bio-based urethane coatings, composed of lower levels of petrochemical, lower VOCs and reduced odor aiming to create sustainable products and increase its product portfolio.